An O-Ring is a product used in sealing applications. Typically an O-Ring is an elastomeric ring, manufactured to be a compressed, static seal between non-moving parts. O-Rings can be used as a face seal on a valve, and used on rotating shafts inside a valve. An O-Ring is a gasket consisting of a flat or round ring of rubber or urethane; used to seal a joint against high pressure. Two dimensions define the size of an O-Ring: its inside diameter (ID) and its cross-sectional diameter, and these sizes can be inch or metric. A good rule of thumb when trying to ascertain if an O-Ring is in inch or metric dimensions is to know where the equipment the O Ring is utilized on was manufactured. If manufactured in the USA, the O-Ring is likely an inch series, if manufactured anywhere else it is likely metric. O-Rings are available in numerous materials and durometers. What type of material utilized depends on the application. The most common material utilized is Buna. Buna is the least expensive O-Rng material and utilized in the majority of applications. Viton is also a common O Ring material. Viton is more expensive but is better in higher heat applications and more resistant to most chemicals than Buna. Silicone is also used as an O-Ring material in many applications, particularly those that require resistance to extreme cold and heat. 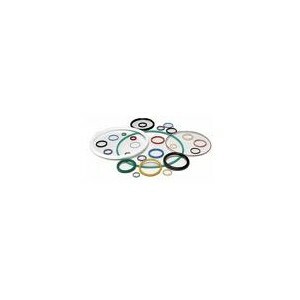 O-Rings also are available in different durometers or hardness. The standard durometer is 70. It is common to also have applications that require 75 or 90 durometer O-Rings. O-Rings can be spliced to size out of O-Ring cord. Standard O-Ring cord cross sections include both inch and metric sizes. An O-Ring splice kit is a good tool for most industries to possess as it allows the end user to manufacture O-Rings on site for their specific applications. Standardized O-Ring kits are also available at a low cost and can cover a majority of an end users applications. Bearing Service stocks most common series of O-Rings, O-Ring cord and both inch and metric O-Ring kits. Please contact a Bearing Service representative to assist in providing the correct O-Ring for your application.